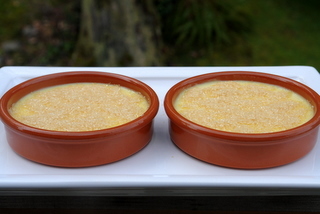 Crema catalana is a Spanish custard dessert very similar to crème brulee. This creamy dessert is made with milk, cream, egg yolks, sugar, vanilla, orange peel, and cinnamon. I had this amazing dessert for the first time a couple of summers ago in a beach town in Costa Brava (Cataluña). We had dinner with the kids at a nice restaurant next to the beach and then went for a walk. For some reason we didn’t have dessert at the restaurant, but after walking for a while we thought it was time to have something sweet – or they were whining about not getting any dessert. We found a little ice cream shop and were about to get some for the kids when we found out that they only took cash (and we didn’t have any). We tried to find an ATM but it was nearly impossible so we started walking back to the hotel. On the way there was a small restaurant, very noisy and full of people watching the Barcelona-Real Madrid match. We went in and asked if we could just order dessert, they said yes. 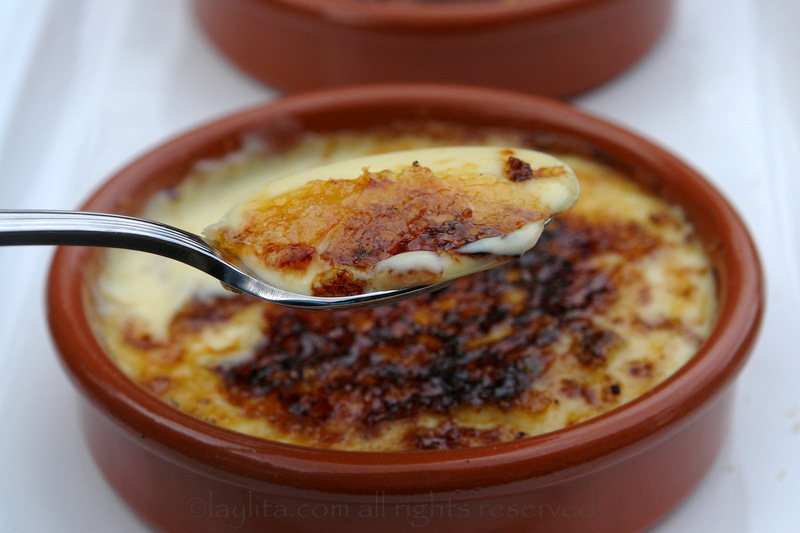 I saw the crema catalana on the menu and had read about it my guide book as something good to try so I ordered it – it was so good! From then on I ate it as much as I could when while we were in Spain. 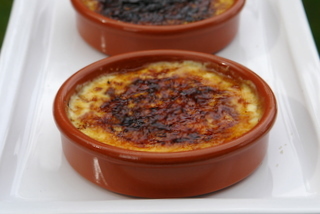 Crema catalana is a Spanish custard dessert very similar to crème brulee. This dessert is made with milk, cream, egg yolks, sugar, vanilla, orange peel, and cinnamon. Bring the milk, cream, vanilla, orange rind and cinnamon (if using) to a boil over low heat. 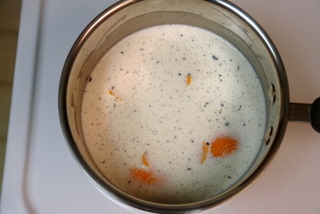 Strain the milk and cream mixture to remove the vanilla bean, orange peel strips and cinnamon stick. 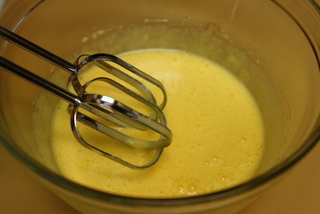 Mix the egg yolks and ½ cup of regular sugar until you obtain a thick creamy mixture. Dissolve the cornstarch in ¼ cup of milk mixture, the stir it back into the remaining milk. 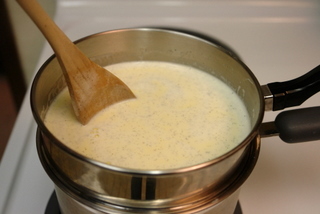 Mix the milk in with the eggs and sugar, place it in a double boiler pan (or in a heat resistant glass bowl in a pan of water baño Maria style) over medium low heat, and stirring consistently until the cream thickens, do not let it boil. 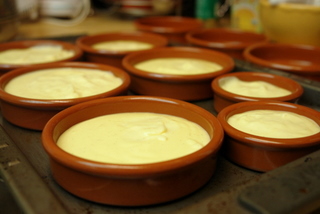 Cool the cream and pour into the ramekins or cazuelas. Chill for 24 hours or overnight. When ready to serve sprinkle 1 tablespoon of the raw sugar over each ramekin or cazuela, heat the iron and press it against the sugar until it is burnt. You may also use a torch or place it under the broiler in the oven. 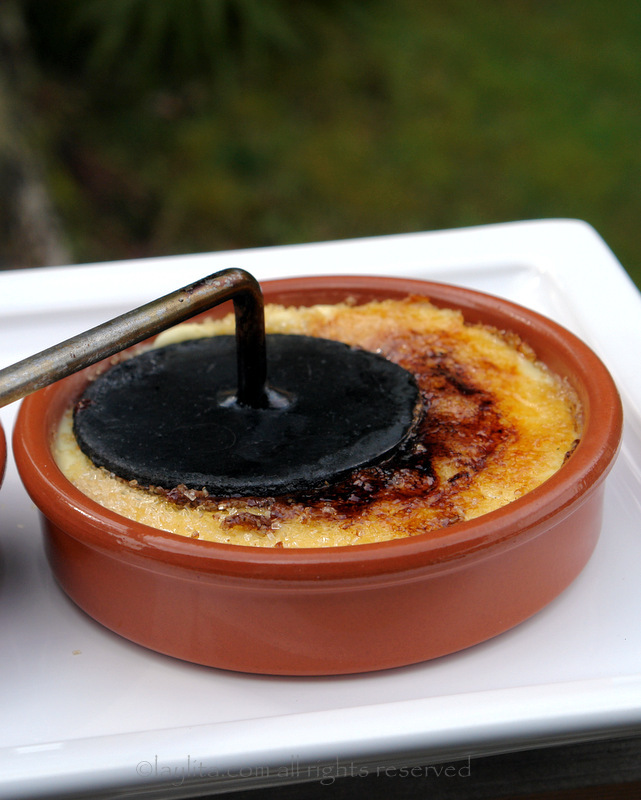 When we returned to the US I decided to make crema catalana, then I realized that I should have bought the round iron device to burn the sugar and the small cazuela molds in Spain. So for a while I just made it using ramekins and using a torch or oven broiler to caramelize the sugar. Then one day I was at one of my favorite stores here in Seattle, The Spanish Table, and found that they had the cazuelas and they also had the iron device. I love using it and the kids think it is so much fun to watch the sugar burn. 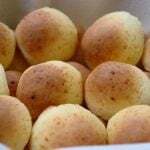 I also think that it makes the burnt sugar taste better and it is easier to keep the cream or custard cold than using the oven broiler. 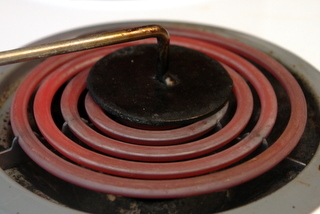 To heat the iron I press it against the stove burner (just make sure the burner is clean) or on the stove flame (for a gas stove), you could also heat in the fireplace or grill. 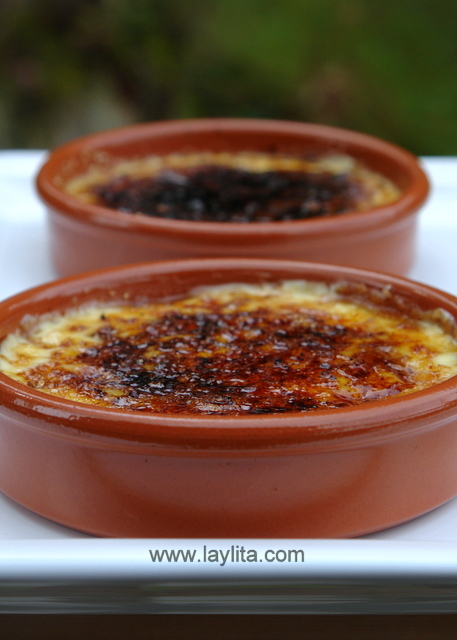 Now, apparently there is a dispute between Spain and France about which came first: crema catalana or crème brulee, each side claims that the other stole the original and changed the name. 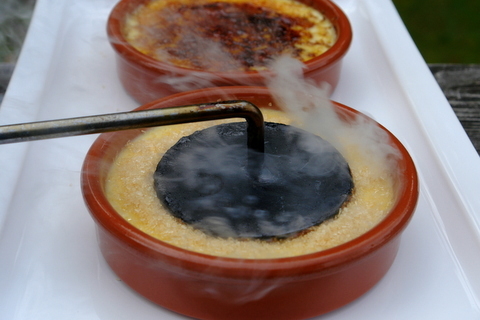 While they are very similar, the crema catalana is cooked on the stove instead of the oven. Also one of the things I love about the crema catalana is the way the sugar is burnt or caramelized: using a small round hot iron. 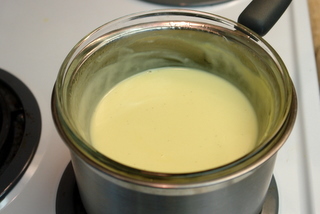 Crema catalana also uses citrus peel (orange or lemon) to flavor the custard. You can also use cinnamon, I don’t always use cinnamon mainly because my husband has this weird anti-cinnamon thing going on. This Spanish dessert is also lighter than its French counterpart, I made it using a 2:1 ratio for milk to cream, to make it even lighter you can make it just with milk, but use whole milk. 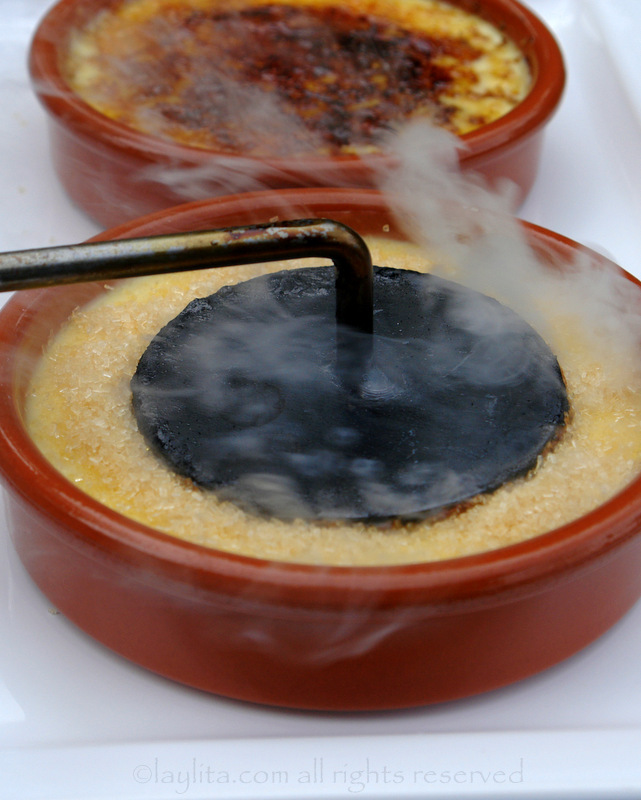 Crema catalana is traditionally served on March 19th in honor of San Jose (Saint Joseph), which is a big holiday in Spain – equivalent to Fathers day. I’ve been meaning to post this recipe for a while now, and was reminded about it when I checked Facebook this morning and someone was wishing a happy day to everyone named Jose. Feliz día de San Jose! What is the “cream?” Heavy cream? I’ve seen other recipes that calls for cornstarch, but not yours. What’s the difference? Thanks! You can use regular whipping cream or heavy whipping cream. My recipe does use cornstarch, it helps thicken the cream. So glad I found this recipe. It’s in the fridge right now in prep for our final planning dinner for our upcoming trip to Paris and Barcelona. We’re doing tapas, and this should finish our small plates off very nicely. For a past dinner I made creme brulee and can’t wait to compare — just tasting the remains of the warm custard I could already tell it was a bit different, the cinnamon and lemon zest impart a deeper flavor than just the vanilla. Great recipe! It looks great! 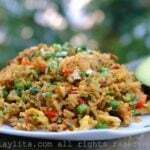 A friend and I are hoping to make this for a Spanish cooking class we are taking in college. How many people does this recipe serve as we have to get all our classmates in on this deliciousness? Hi Bruno – It serves 8-10, depending on the size of cazuela or mold that you use. Thanks Laylita. It turned out great and everyone really enjoyed the crema. It served a little less than the 8-10 cazuelas but it turned out fine in the end. Thanks once again. How would this dish hold out if it was kept in a fridge overnight and then while I drove to school be out at room temperature for around 30 minutes before being placed in a fridge again for around 4 hours before we ate it? Hi Shivani – Keeping the crena catalana at room temperature for the 30 minute drive should be fine – if you wanted to be extra cautious you could put them in the freezer for 30 minutes before you leave for school, but it probably isn’t necessary. I was born in a little town outside of Barcelona “Sabadell” and raised in Geneva Switzerland, and my grand-mother and mother use to make it often to keep our traditions, I use to eat it warm just as it got done. My mother besides the lemon peel she put a cinnamon stick adding to the flavor. I love it and make it here at home in the Seattle area. Enjoy! I love your blog. 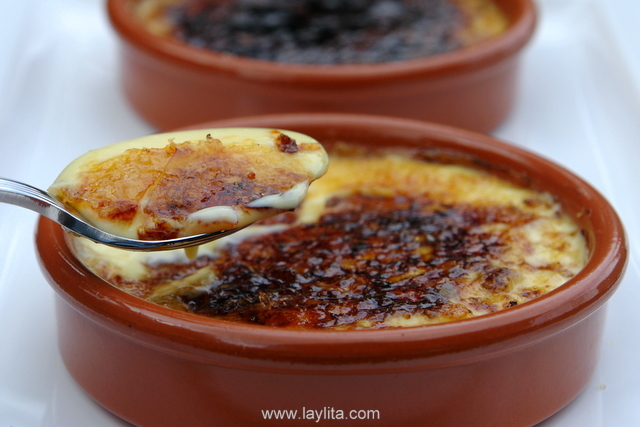 The Crema Catalana took me back to when I lived In Lloret De Mar on the Costa Brava. There was this one place that served only chicken, bread, wine and crema catalana. I loved the chicken, the bread but I was CRAZY for the crema catalana. Here in the US I have to settle for Creme Brulle . I always order it first, before my food so I can really enjoy it! Then I get another after dinner. Bad girl! But it is so wonderful. Now thatnks to you I will be making crema catalana en casa! Mmm that’s lovely! My parents have a home a few kilometers from the Spanish border in French Catalogne and she knows she will just HAVE to make those whenever I show up for a few days! Your picture looks lovely. And yes the iron is essential, you can’t get the right crunch without it. My Mom also uses anise seed in her crema. WIth the citrus peel, it’s like a little explosion of flavor in your mouth at every bite. I LOVE your blog. Question about this recipe. Do you think I could put the cream into one larger dish rather than the individual remekins? I am making this for a party and am not certain of the total guest count so am thinking a larger dish might work. What do you think? The creamy consistency might make it a little messy to serve, but other than that it should be fine. Congratulations on your incredible blog. I am not usually one to comment on other people’s blogs, but your blog deserves it. Your pictures are excellent, your recipes are generous and tasty (I have actually cooked a few with great feedback from unsuspecting lab rats), and your experiences and stories are the icing on the cake… Thank you for taking the time to put all of this together! I am a fan! Today is my Saint Day, San Jose. When I was growing up it was a big holiday at home in Barcelona since my mother’s name was Josefa too. I remember all the family gathering and giving us gifts, and my grandmother making platters of crema catalana. I am now living in the US and I miss it so much! This took us back to Barcelona! So good we made it for Thanksgiving (with homemade pistachio biscotti) and now for Christmas (with homemade chocolate-dipped biscotti). Not that it needs biscotti, but we liked the contrast. Thanks so much! I LOVE this dish, had it in Spain too and tried to recreate it here…this is the first time I found a recipe that is in English….and not catalana that seems authentic. We just returned from Madrid and Barcelona where we were introduced to this dessert (at Montserrat and we did buy the set to make it!). Thank you for posting these pictures and an additional recipe. It is amazing how the desserts in Europe are not as sweet as in America…something to learn from them! Love your site – keep it going!! 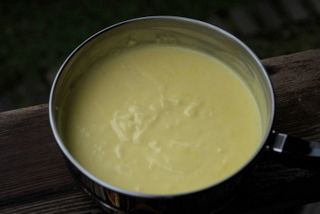 My mom used to make a mexican pudding that sounds like crema catalana. I am looking for the recipe. I remember helping her as a child stir the pot on the stove. She would tell me NOT to stop because it would burn. I remember it had milk. She would pour it into large bowls and sprinkle with cinnamon. She would pop them into the refrigerater. We had to wait into the next day to eat. I am Looking for this recipe. 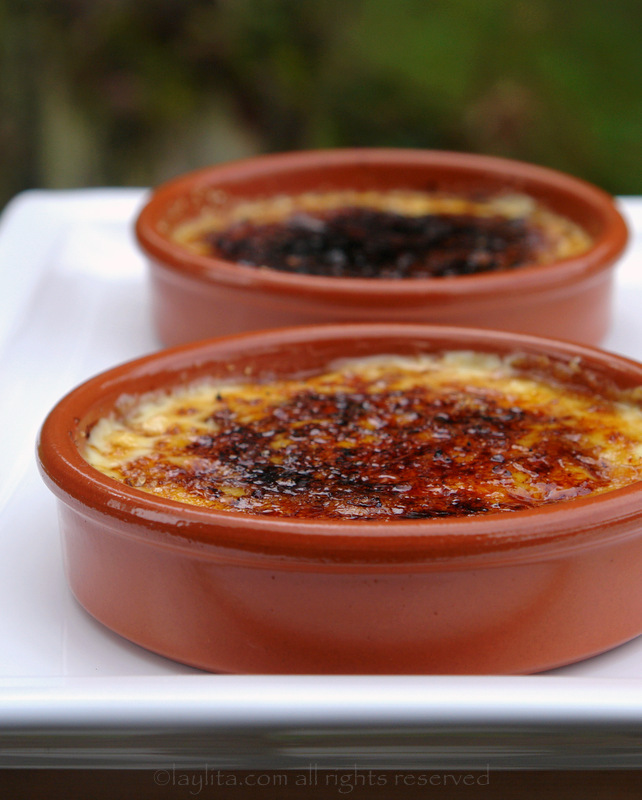 Crema catalana/brulee, flan, pudding…..this dish and all its variations are my favorites! thanks for introducing me to another yummy version! As always, beautiful photos and unique recipes–thanks, Layla! Once again the food looks amazing!! mouth wathering, just brilliant.. can’t wait to make it and tase it.. You are an artist the way you present your recipes.!! Thanks for another outstanding and totally indulgent post! You know how to take beautiful pictures. That dessert looks so good. Looks delicious and I enjoyed reading about how you discovered this dish. What a beautiful site! I love the photos, the recipes, your style, everything. Keep it up! oh my… I have collected those clay bowl with such dessert inside! Now, I can use them for this treat. The round hot plate is unique! It made the burnt surface evenly compared to using a torch… Genius! What a beautiful dessert and your photos are just gorgeous. I enjoyed reading about your experience in Spain! This is a beautiful rendering, Laylita! I absolutely love your recipes. I actually made several empanadas tonight, leek, mushroom, margarita and veggie. They were wonderful and we are making some for the vegetarians at a church dinner in a couple of weeks. I made a quick chimichurri sauce and a honey mustard sauce. Fabulous! My only problem with a recipe like this is you do not give portions. How much does this make? For how many servings, what size? Sorry to be the picky patrol, but inquiring minds want to know. Hi Scotia – I know I’m bad about giving portions, most of the recipes are for 6-8 people, usually if it less or more I will give portions. 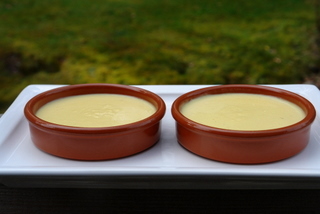 For this dessert you will get 6 of regular sized cazuelas (about 1/3 – 1/2 cup of the crema catalana goes into each cazuela) and 8 of the mini-cazuelas (about 1/6 – 1/4 cup of dessert in each one). Hope that helps and I will try to be better about giving servings. They looks wonderful! A delicious dessert! No.Way. I can’t believe I am just now finding your blog. I love it!!!!! this dessert looks amazing.